Peugeot is considered to be the most prestigious French bicycle. In the early 1920s, a Parisian company named SICAM (“Société Industrielle de Construction Automobile et Motocycliste”) began constructing engines for bicycles. Marcel Violet (a French specialist in 2-stroke engines) and engineers Charles Benoît (inventor) and Abel Bardin (manager) lead the wave of motorization of bicycles in France. 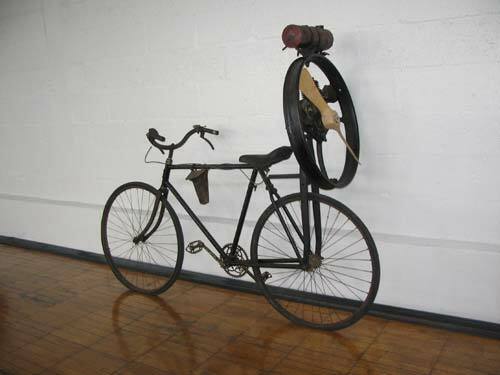 They designed a 100cc, 2-stroke engine to be mounted in the triangle of a bicycle’s framework. Although it is unknown why a propeller was added, it is known that France was exploring propeller propulsion about this time. 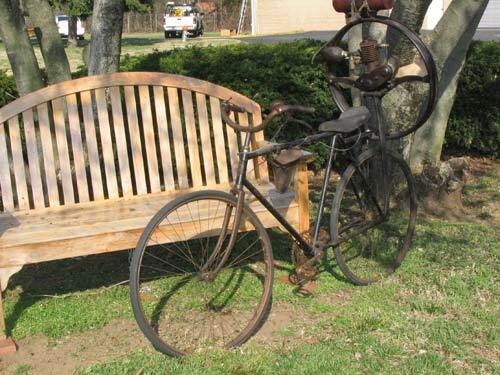 The rim around the propeller seems to be from a car wheel, the frame to hold the engine to the bicycle appears to be the front fork of a motorcycle, and the gas tank may be an oil tank from a car. The engine features a hand-pulled starter and the pedals may be used to assist on inclines.